Garden wooden workshops provide you with a comfortable space that allows you to work on various projects right within your own backyard. Because this a place that you may be spending a great deal of your time in, you will want to be sure that you are purchasing a workshop shed that not only offers a large amount of space, but that also lets in enough light and can be safely secured when not in use. Our custom made wooden workshops are made from only the finest timber and other materials to fit your needs. We would happily recommend any of our wooden workshops from our standard, tanalised, security or Beast ranges, as they all have heavy duty floors and durable wooden frameworks! But the 'creme dela creme' of workshop sheds would be from the Beast range, at least a 14x8, with double doors, plenty of headroom to walk around in, and a few shelves for good measure! If you like the sound of that as your workshop shed you can buy a shed like it here. 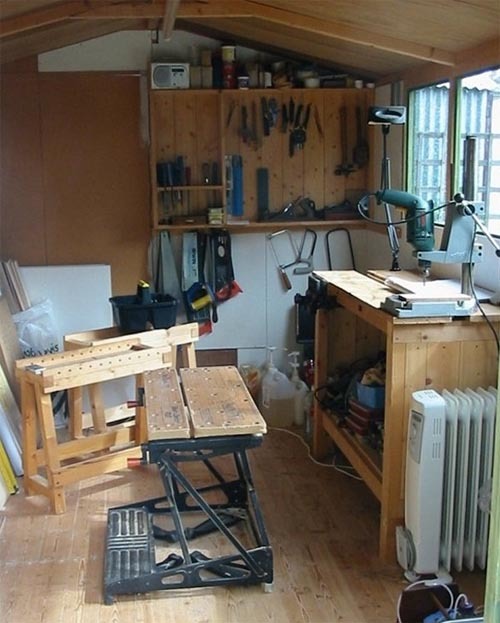 Why buy a workshop shed when you could make your own?